Pliable clear nylon cables with nickel-plated copper joins. The 12 inch bamboo circulars have steel stranded cables on US sizes 0 through US 2.5. Sizes 3 and up have the clear nylon cables. 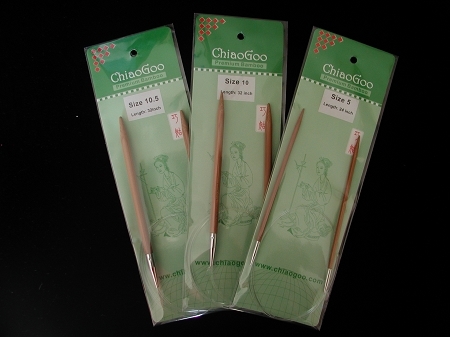 ChiaoGoo 12 inch (30 cm) patina, bamboo circulars have fantastic joins and pliable, clear, nylon cables. They have a nickel-plated, copper join. Sizes 3 (3.25 mm) and larger are crimped to guarantee no separation AND they swivel! Sizes 0 (2 mm) through 2.5 (3 mm) do not swivel at the joins. Sizes 0 (2 mm) through 2.5 (3 mm) have the same memory-free cable as the ChiaoGoo RED circulars and TWIST cables but without the red nylon coating! Needle size is permanently laser imprinted on each circular. Bamboo circulars are available in the patina color only. Q: Do the larger sizes have short needles also? For example size 8 and 9? thank you.